Clients frequently ask me what they can do to make their boat sell more quickly in a crowded brokerage market. Of course there are many ways to upgrade a boat, but the #1 way to stack the odds in your favor is to make the boat look as good as possible. It will immediately set your boat apart from other offerings on the market. First impressions count, and a small investment in time and money will truly pay dividends, whether you’re selling a 20-foot center console or an 80-foot ocean-going yacht. Cleaning up the boat when you first list it means your broker can take pictures that show the boat at her best and gives you a good foundation to keep the boat clean for showings moving forward. Your broker can and should spend a little time “staging” a boat before a showing – arranging cockpit cushions, straightening up lines, etc. – but a broker should not have to spend an hour to make the boat presentable. You’re better off having him/her spend that hour on the phone trying to line up more showings! Let’s start with something even more important than looks: how does your boat smell? The psychology of smell is a much bigger factor in “falling in love” with a boat than you might think, and you are trying to get the prospective buyer to fall in love! The head is the obvious culprit here. Is the holding tank full? Sign up online with soundkeeper.org for their free mobile pump-out service, which will help keep head odors down. Remember to do a freshwater rinse of the holding tank as often as possible (not as important for systems that flush with freshwater). If you have a major odor problem, it’s probably time to replace the hoses. Talk to your broker and see if it makes sense to address the issue now. Finally, don’t kid yourself about air fresheners masking the problem – nothing is worse than a perfume of cheap air fresheners and head odor on a boat that has been closed up for days, weeks or longer. Smells also hang out in the bilge, which is where many more experienced buyers look first. Take an hour or two (or pay a professional) to thoroughly scrub the bilge. Make sure to get to all compartments and check that they are draining properly. Finally, invest in a bottle of bilge cleaner and pour in a few tablespoons every time you’re on the boat; it will do wonders. Hopefully you now have a clean bilge and a nose-friendly boat. Now it’s time to remove the clutter. Expired flares, extra bedding, old foul weather gear, that RDF you keep “just in case” – it should all be removed or stowed out of sight. Don’t forget the lazarettes and other lockers. Remove any gear that is excluded from the listing, if possible. Remember, the prospective buyer is coming to see your boat, not your stuff! Next, go to the engine compartment. A little bit of attention goes a long way here, too. Cleaning the area around the engine with a de-greaser and putting down a fresh oil-absorbing pad will do wonders, and also help keep the bilge clean. You might discover a small leak or two in this process – get it addressed! The deck and topsides should be easy to keep clean; a hose, bucket, scrub brush and boat soap go a long way. Don’t forget the gutters around lazarettes and anchor wells; they hold dirt and grime and can make for an unpleasant surprise. If your boat is sitting for long periods, check the deck scuppers periodically for clogs. Finally, consider a buff and wax of the topsides and the deck. This will require spending a few more dollars, but discuss it with your broker – it may be worth the investment. If your boat is listed for sale over the winter, there are a few extra steps you can take to keep her looking good. A shrinkwrap or custom canvas cover is a necessity here in the Northeast. In either case, there should be a zipper access door that can be readily accessed via ladder, and the cover should be high enough that prospective buyers can move from bow to stern. Make sure your yard cuts a few vents to let moisture out. Taking the interior cushions home for the winter is a good idea, but discuss it with your broker – leaving a few so the buyer can see the color and condition will be helpful. Finally, make sure the shrinkwrapping and decommissioning crew doesn’t leave muddy footprints all over the deck. That’s really all it takes to put your boat in the best possible light for potential buyers. Remember, appearances are everything, and first impressions count. Nothing kills a prospect’s excitement faster than walking onto a dirty, smelly boat. And nothing in turn kills a broker’s enthusiasm for the listing than repeated disappointing showings. Don’t think that you can price the boat below market and get away with it being a complete mess; it just doesn’t work. Keeping the boat clean will give you the best possible chance for a quick sale at a good price, which means you can move on to the really important stuff: finding your next boat! 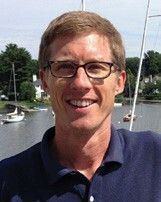 Michael Beers has been with McMichael Yacht Brokers since 2007. Prior to that he taught sailing and worked on the schooners Adirondack and Adirondack II. When he’s not busy advising his clients on cleaning, selling and buying boats, he sails a C&C 33 with his wife Hallie.